What a 4th of July! Fireworks, barbecue, truly a day for people all around the United States of America celebrate freedom from tyranny and oppression. Plus, half-off mattress sales. But imagine my surprise when I saw this on the National Mall, in the heart of Washington, D.C., the capital of our great nation. 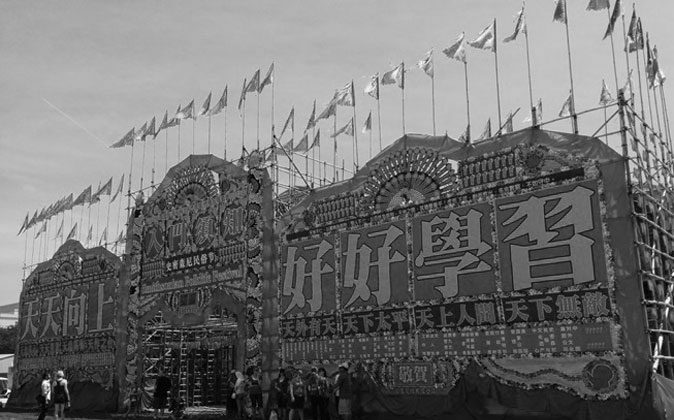 It was a banner at the entrance to the China exhibit from the annual Smithsonian Institute Folklife Festival. This year, according to the Folklife Festival website, the China exhibit is sponsored by organizations such as the Chinese Embassy and Ministry of Culture. The banner said, “Study well and make progress every day.” Now, that slogan looks familiar, where have I seen it before? Oh, that’s right! You see it everywhere in Chinese schools. Children are made to recite it all the time. Well that’s a great phrase. Sounds like whoever said that really valued hard work and intellectual thought. Mao said it. That’s right, the same Mao Zedong who killed millions of Chinese and forced everyone into his personality cult that included mango-worshipping. So on the Fourth of July, in the National Mall of the capital of the United States of America, there is a giant red Maoist slogan. That phrase entered popular usage during the Cultural Revolution, a spasm of violence that swept China for a decade. So what’s it doing as part of the Smithsonian Folklife Festival? When festival organizers were asked to comment, they said that the artist, Danny Yung, did tell them that the phrase was “historically associated with Mao Zedong, but today it is interpreted in different ways, many having nothing to do with Mao Zedong.” And they further defended it by saying that the phrase has a specific meaning to the artist. Oh. Well, then. I’m sure the organizers will look kindly on my submission for next year’s festival, a giant burning cross. I know it has historically been associated with the Ku Klux Klan, but today it has different interpretations, many of which have nothing to do with the terrorizing and killing of innocent people. But really, the Communist Party has been trying to pass off its propaganda as “Chinese art and culture” for years now. In January 2011, at a White House state dinner, Chinese pianist Lang Lang performed the theme song from a movie called “Battle on Shangganling Mountain.” That’s a famous anti-American propaganda piece from the Korean War that calls American troops jackals. During the Cultural Revolution, there were only eight artistic performances allowed in China. Red Operas, they were called. They were all approved by Mao’s wife Jiang Qing, who’s known in the West as Madame Mao. “The Red Detachment of Women” is one of them. Another is “Taking Tiger Mountain by Strategy.” For the 2013 CCTV New Year’s Gala, the Confucius Institute, whom you may remember from my recent article about its attempts to spread propaganda in Canadian schools, invited Canadian opera virtuoso Thomas Glenn to sing. Guess what they made him sing? Of course they didn’t tell him what “Taking Tiger Mountain by Strategy” was about. Ironic though that the Confucius Institute had him sing from a Red Opera, considering they were one of the primary tools Jiang Qing used to attack Confucius. Wait. Is that irony or tragedy? I can’t tell anymore. All of this Red Opera stuff was meant to teach Chinese people to use “violent struggle” against their enemies. By which I mean, the Party’s enemies. The Party has always seen the arts as a powerful way to spread its propaganda. So powerful that eventually, people would mix up propaganda and Party culture with authentic Chinese culture. And so in the West, a lot of what gets promoted as “Chinese culture” is in fact communist propaganda. And most of us don’t know the difference. Regarding the piece with the Maoist slogan, the Smithsonian said that it didn’t want to “limit [the artist’s] free expression.” In America, we do have the right to freedom of expression, and Independence Day is definitely a time to remember and appreciate this freedom. But, freedom also comes with responsibilities. And I would argue that one of those responsibilities is understanding what we are expressing or promoting. And realizing the consequences of that. And when it comes to this kind of propaganda, the kind that’s mixed up with arts and culture, we often don’t understand that at all. So we end up with a Maoist slogan in the middle of the National Mall, as part of a festival that celebrates traditional Chinese culture. The very culture that Mao in fact tried to destroy. Now that is ironic. Hitler said that. See what happens when you don’t cite quotes? For more China Uncensored, please visit youtube.com/ntdchinauncensored. The university in Zhengzhou, central China's Henan province, made a series of attractive posters to welcome the freshmen on their arrival.